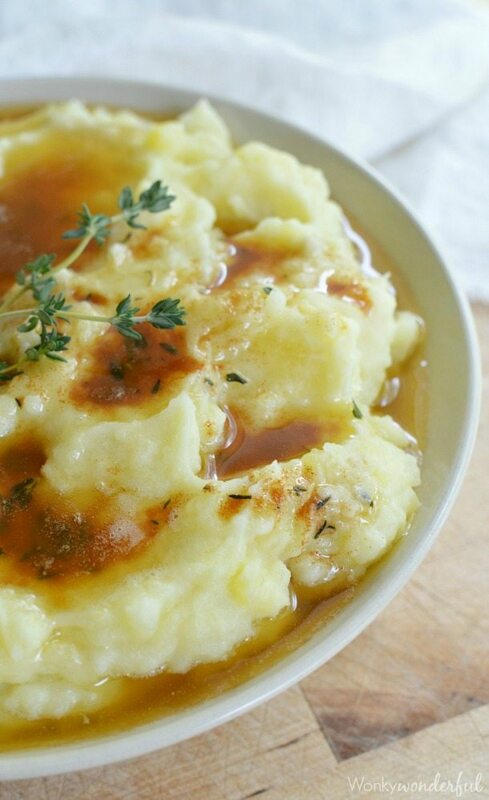 What makes this The Best Mashed Potatoes Recipe? Several things. 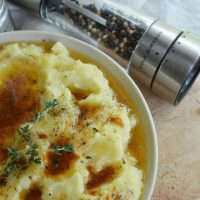 These creamy mashed potatoes are easy to prepare, perfectly seasoned and drenched in thyme infused brown butter! 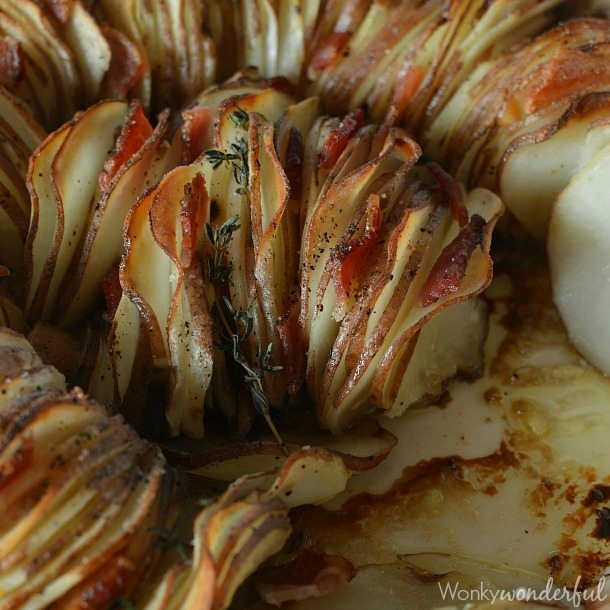 This unique twist on a favorite holiday side dish is sure to be a hit! Mashed potatoes are my JAM! I love, love, love me a generous helping of taters. When I am serving myself up a holiday plate, I allot half of the plate just for mashed potatoes! Comfort food at it’s best. There is nothing more comforting that buttery potatoes that have been perfectly seasoned with fresh cracked salt and pepper. 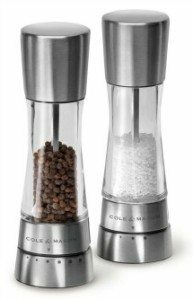 My Cole & Mason Derwent Salt and Pepper Mill Set gives me the ability to choose the type of salt and pepper that will highlight my recipes. For this recipe I used Sea Salt and Rainbow Peppercorns. The Cole & Mason Mills have high quality mechanisms that ensure precise grinding. Both mills come with a lifetime mechanism guarantee. 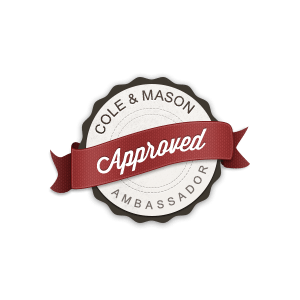 Order your Cole & Mason Derwent Salt and Pepper Mill Set and you will be seasoning like a pro! 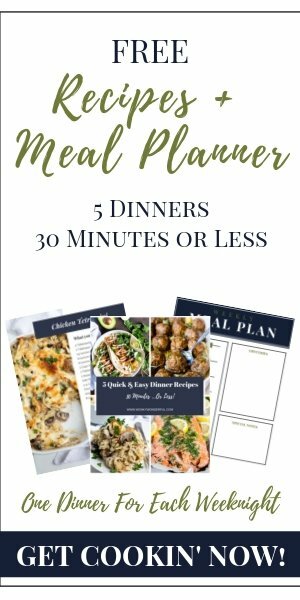 They also make the perfect hostess gift! Brown butter is all the rage the last couple years. It sounds fancy but is really simple to create. It is just a matter of heating butter until it turns a golden brown color. Brown butter adds a special flavor to otherwise plain dishes. Dare I say a ‘complex flavor’ without getting thrown out of here for being too pretentious?!? Check out this Brown Butter Tutorial for step by step visual instructions. The most important step . . . seasoning. There is nothing more disappointing than underseasoned potatoes. B-O-R-I-N-G.
You want to have a light coating of fresh cracked salt and pepper over the top of these mashed potatoes. It will bring the dish to life! 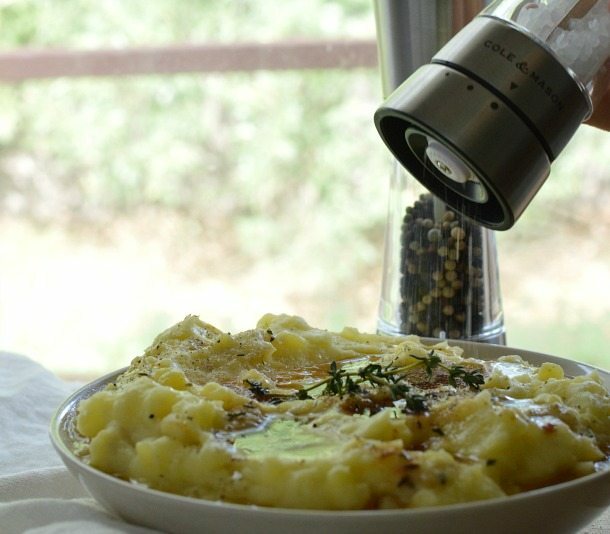 Is there anything more glorious than mountains of mashed potatoes flecked with salt and pepper? Nope. And just look at that butter shine! In large pot, cover potatoes with water and boil just until a fork can be easily inserted into potatoes. Turn off burner, drain potatoes and return to pot. Add butter. Mash** to desired consistency. Stir in milk a half cup at a time until creamy. Cut 1/2 cup butter into cubes. Melt butter in saucepan over medium heat then add the thyme. Stir continuously the entire time. Remove from heat once the butter has reached a golden brown color. (takes about 4-5 minutes). Remove and discard sprigs. (some thyme leaves will remain in butter. Transfer mashed potatoes to a serving dish. Pour brown butter over the top. Generously season with fresh cracked salt and pepper. *White or red potatoes work great too! **I use a manual potato masher. An electric hand mixer can also be used. If you like these taters, you’re gonna love my recipe for Garlic & Bacon Roasted Potatoes! I never thought to use brown butter in the potatoes, but I think this is genius!! And I love thyme, too, I put it in everything. I’m totally making this recipe! I am totally with you on all of this! Mashed potatoes are my absolute favorite part of Thanksgiving, and yes . . . half my plate, devoted to potatoes. For sure. I also just wrote an entire blog post about how to season them properly. Because yeah, bland potatoes are the worst! I am loving this brown butter idea. Yes – mashed potato girl here too! I have to say, your mash looks waaaaaaaaaaay better than mine ever did. I need to try this recipe!! 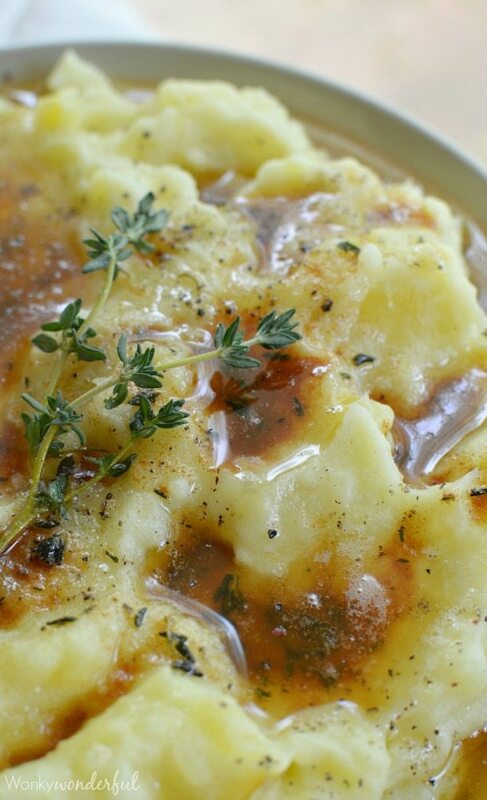 Always on the look out for a yummy new recipe for mashed potatoes and wow at that brown butter! There are so many fabulous things going on here I cannot stand it!! 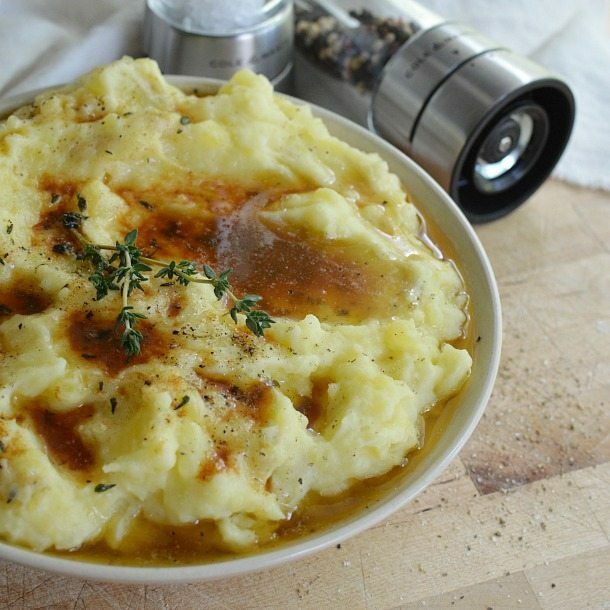 What a fabulous way to change up ordinary mashed potatoes. These look soooo good! And I’m totally on team lots of pepper/brown butter/herbs a plenty. Yes! can dried thyme be used instead of thyme sprigs? if so, how much? 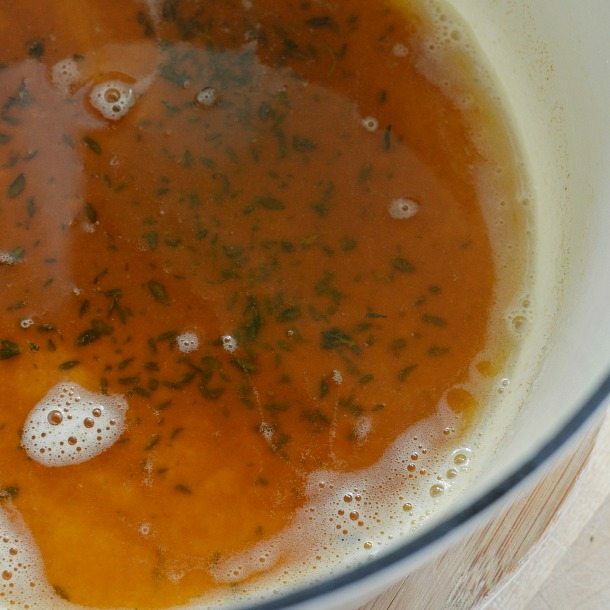 Yes, you can use dried thyme. I would start with 1/2 teaspoon and increase from there depending on personal taste.